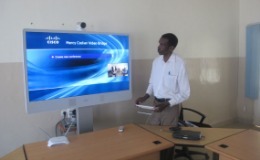 Telemedicine, a trend of offering medical services that started as early as 2011 at Rwanda Military Hospital. The aim of this new approach was to improve student training and consequently medical service delivery through regular consultation of experts on advanced medical cases. In an enclosed room at Rwanda Military Hospital in Kanombe, students listen attentively to instructions from a video interaction. This is part of their medical training, a session that allows them to interface with senior health professionals from top countries around the world.